The expected verdict in the death of Rachel Corrie, killed under the wheels of an Israeli-modified Caterpillar bulldozer in 2003, came down today and the court found no fault with the Israel Defense Forces. That was no surprise. But the deafening silence about it in Washington is nonetheless reprehensible. that Israel, an ostensible ally and fellow democracy, will at some point do the right thing. I’m sure, though I haven’t spoken with them in years, that the Corries held out little hope that this verdict would be that point. But what is perhaps most stunning is that there is no clamor in the United States, aside from those whose sympathies would be with Rachel’s cause in trying to protect Palestinians from the ravages of occupation, for some kind of action on behalf of a US citizen who lost her life on foreign soil under, to be kind, questionable circumstances. I admire Cindy Corrie’s restraint. But the US failure here is much broader than what she is saying. And it’s a long term one. On March 25, 2003, Congressman Brian Baird (D-WA) introduced a resolution in the House of Representatives calling on the US government to “undertake a full, fair, and expeditious investigation” into Corrie’s death. The bill gathered 77 co-sponsors, which is not a large number, though a larger one than is typical for a bill critical of Israel. But none had the political muscle to counter defenders of Israel in the House, so the bill died in the Committee on International Relations. Its death, like its existence, generated little attention. Indeed, the US’ official position is to press Israel for such a thorough and credible investigation. But nine years later, the Corries were reduced to trying to file a civil suit because there was simply nothing else happening. So much for US pressure. Let’s be clear about this: we have a US citizen who met her death on foreign soil. The State Department and both the Bush and Obama Administrations believed that the investigation into her death was unsatisfactory. George W. Bush, surely not a president anyone would cast as less than enthusiastic in his support of Israel, personally requested a deeper investigation from the Israeli Prime Minister. And nearly a decade later, all our ambassador to Israel is doing is reaffirming that Israel hasn’t done enough. Is there a better example of the absurdity of the US’ relationship to Israel than Rachel Corrie? It doesn’t matter if one believes that she had no business going to Gaza in the first place. The fact is that Israel has not explained her death to the satisfaction of its closest ally and patron. If this was any other country — including Great Britain, or Canada — there would be a massive outcry and the US wouldn’t rest until the questions were answered and some kind of accounting was seen. But not with Israel. The relationship is not special, nor is it because it is “cherished,” in the ridiculous words of Mitt Romney. This is the relationship of an over-indulgent parent further spoiling an already selfish and harmful child. As we watch an Israeli Prime Minister brazenly interfere with a US presidential race, and try to manipulate the US into a war that is against our (and Israel’s) interests, we might also notice that our government is not fulfilling its most fundamental obligation: protecting its citizens overseas. If Israel wants to make the case that Rachel Corrie’s death was an accident or was merited by her actions, then a transparent investigation that meets basic standards of credibility is the way to do that. That Israel refuses to do that would seem to indicate that they do not believe that the outcome of that investigation would be to their liking. Surely it cannot be about secrecy for security’s sake; Israel is no longer present on the ground in Gaza and the tactics, equipment and systems are a decade old. 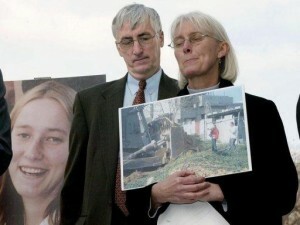 Nothing can erase the tragedy of Rachel Corrie’s death. But her death offers an opportunity for the US to finally start to try to curb Israeli impunity. Palestinians are injured and killed regularly, and cases are often closed without resolution or even due investigation, as one can easily see by looking at the site of B’Tselem: The Israeli Information for Human Rights in the Occupied Territories. And other foreign activists have also been killed by Israeli forces over the years. But the US continues to be inert on the matter. One can only hope the Corries find some solace and peace elsewhere. Israel, at least, has good reason to want to bury the truth behind Rachel Corrie’s death. The United States has only its own cowardice as an excuse.